Being very careful not to say [socks] out loud as some of you have threatened an intervention……… But I’m having soooo much fun! Pair 10 of 16 (16 pairs in 2016) is finished. Took a deal of concentration, a little help from YouTube and a fair amount of frogging, but I stuck at it and am inordinately pleased to have made this start Loving these carbon fibre needles. No intervention needed – learning something new, testing my brain and having a BALL!!! 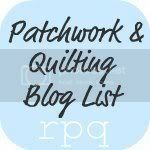 This entry was posted in Uncategorized and tagged needles, sock knitting, socks, yarn. Bookmark the permalink. Meredithe – wow! Does that mean 17 pairs coming up for 2017? Or, may be 17 Beanies? Well done. They are fantastic. I called in to Gisborne last week and spied that sock yarn. Very tempted, but still so much stitching to do. We have been bush camped in Vic gold fields for 5 days with two grandkids (demanding) so not a stitch for all of that time. I am having withdrawals. Meredithe, that pair in the last photo……..are you starting at the toes? I still want to knit more socks. Sewing has taken at back seat!! Toe up socks too! I’m stuck on a pair of socks for my husband at the moment and if I don’t finish them soon I shall go mad. I don’t think all together in my whole life I have had 16 pairs of socks! Much less gorgeous ones like you knit! Amazing. I am barefoot almost always at home and have been known to run outside really fast in the snow barefoot to get the mail. I love hand knitted socks. It’s like giving your feet a massage. A friend and I took a sock making class together several years ago. She’s a knitter but I’m not. It was a toe up class and I loved it! It’s going to be summer soon so maybe you could make a few tennis socks. 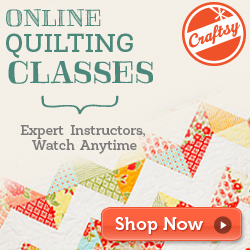 It would take less yarn and you’d get two for your stitching time. I love looking at the socks you have made, great colours and as a non sock maker I am intruiged by the magic trick of matching stripes. Now there is another puzzle for me to solve – “frogging”! Somewhere in the back if my head I associate it with Shakesperian era doublet and hose. Was it the fancy way the doublets were fastened? Now I will have to Google “frogging” to find out! What with you, and Anne, the world sock supply is going to go through the roof! 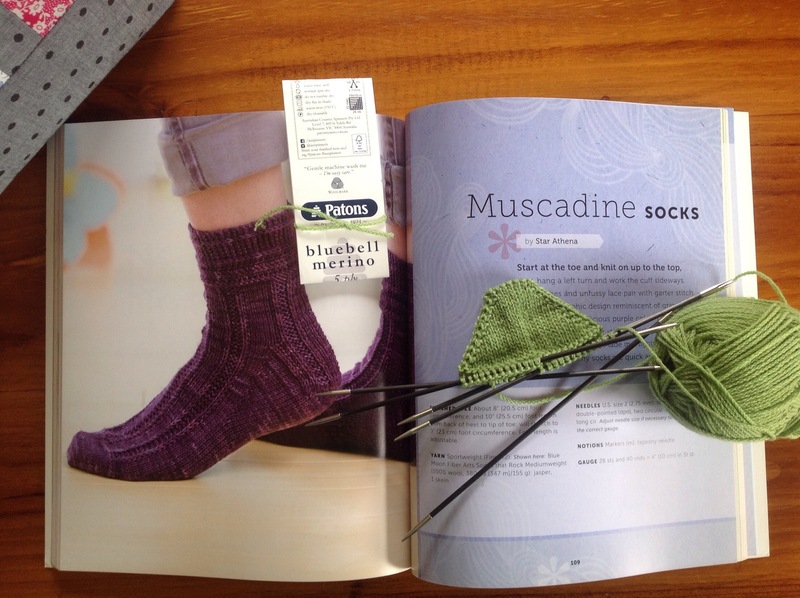 I totally agree, sock knitting is excellent for the brain……and what a feeling of achievement when you can do it! I can’t stop either. Even my husband has requested a pair! 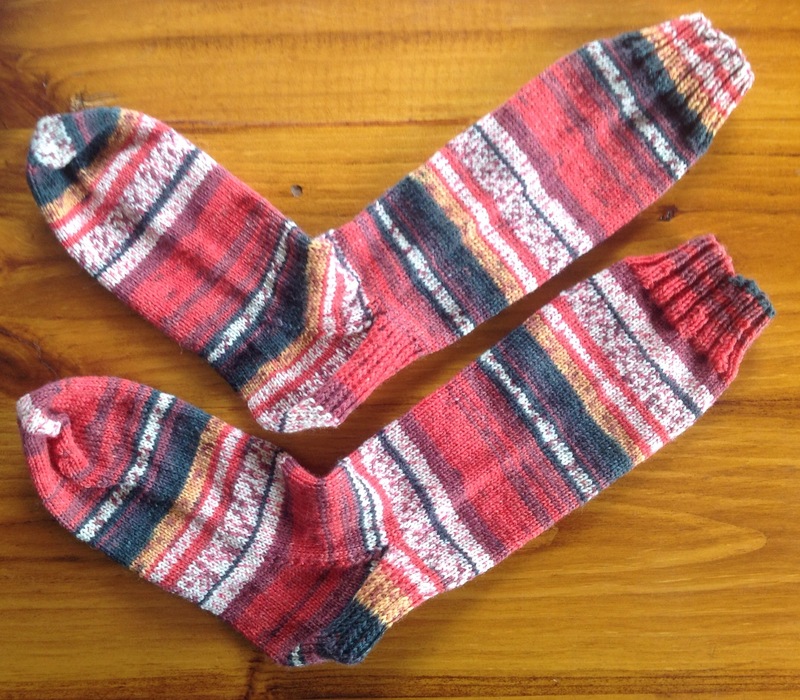 Life is short – knit socks. That said, there is no knitting of adorable socks here – just a baby jumper for a friend. Very pretty Meredithe! I bought some of those cool new needles and then realized I do most everything on circular needles. Doh! Oh my God…and now a book !! Obsession ? what do you mean by there ? Don’t worry M. If you are challenged just sock it to them ! I hope you love knitting toe up. What is wonderful is when you are done, you are pretty done. I knit two at a time toe up socks because I second sock syndrome and this worked out well for me. Good luck on the 16, sounds like a good challenge. 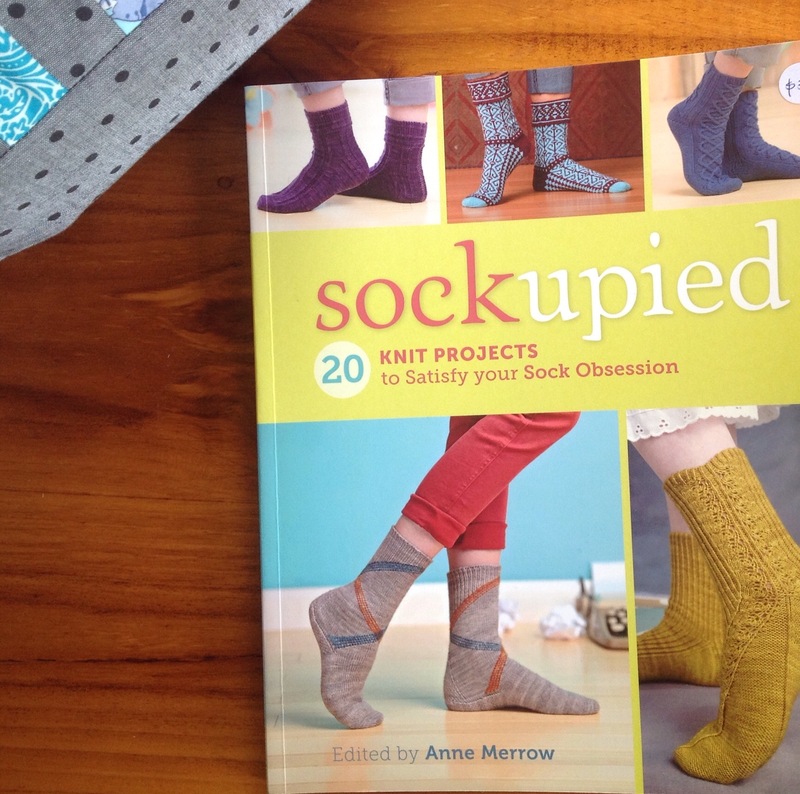 I’m enjoying your sock obsession very much, watching your progress and Anne’s too of course! Do ALL of your socks come from the same book. I’d like to try and knit a pair. My nother used to make ours and now that Im more mature my feet are feeling the colld a little more.